MSM w/GS-500™ / 90 Veg Caps - Nature's Way®. Take 1 capsule up to three times daily. If pregnant, nursing, or taking any medications, consult a healthcare professional before use. What is the source of the glucosamine in MSM with GS-500? The glucosamine sulfate in MSM with GS-500 is extracted from chitin, a hard, cellulose-like compound that is the main component in external shells of crustaceans such as shrimp. Is the glucosamine sulfate in MSM with GS-500 stabilized? Yes. The glucosamine sulfate in MSM with GS-500 is stabilized with sodium chloride. Glucosamine must be stabilized and absorbable to see results. Unstable forms of glucosamine can have less than a 90-day shelf life. 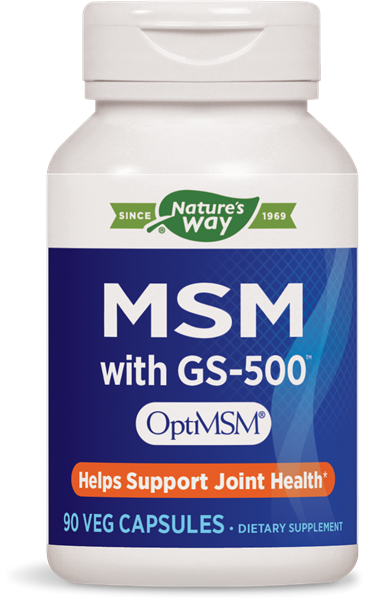 Does MSM with GS-500 have any side-effects with use? Very few side effects have been reported from MSM supplementation. In rare instances, there may be gastrointestinal discomfort and loose stools due to intake of large doses (i.e., several grams at a time). If GI upset occurs, it is recommended to divide the dose. Taking MSM in two or three doses throughout the day, after meals, may reduce the occurrence of GI upset.